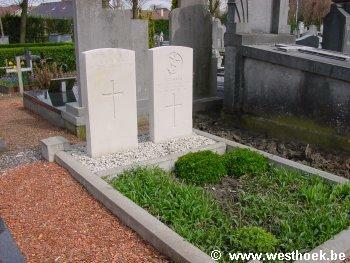 Veurne Communal Cemetery is located in the north east district of the town of Veurne itself. From the Grote Markt the Oostraat leads for 500 metres to the left hand turning onto Oude Vestingstraat. The cemetery is located 500 metres along Oude Vestingstraat on the right hand side of the road. There are 2 Commonwealth burials of the 1914-1918 war, in the West part of the cemetery, 1 being an unidentified British soldier. In the Extension, are a further 77 burials of the 1939-1945 war.